“I have a super loud voice,” Stevie Nicks said with a laugh. The world is thankful for it. Her voice is necessary in times like these. The future is up in the air and Stevie Nicks has stepped up to the plate to be the heroine we all need. She is taking the show on the road and it will be unlike anything anyone has ever seen before. The 27-city tour starts on October 25th in Phoenix and will travel to places like Atlanta, Toronto, Chicago, Philadelphia, New York City and more. 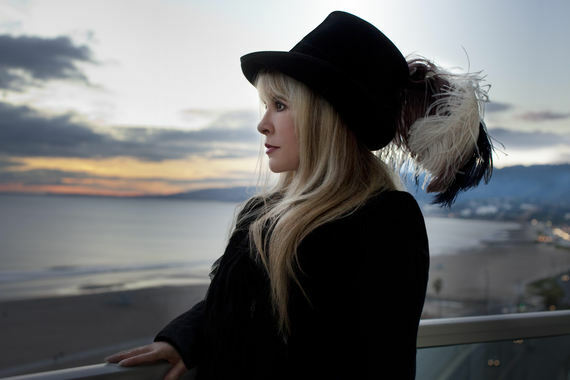 “The 24 Karat Gold Tour” is the next chapter in the mythical career of Stevie Nicks. In an exclusive interview with The Huffington Post, Nicks went into detail about what fans should look forward to when “The 24 Karat Gold Tour” comes to town. “I made a list. I went all the way back into my full catalog because the 24 Karat Goldrecord has a lot of songs. It also does encompass in many ways all the songs from all my solo records. So I’m having to pick. My list ended up to be 31 songs, it’s really ridiculous. I have an amazing opening act in The Pretenders. It cannot be a three hour set like I just finished doing with Fleetwood Mac and I asked, ‘But why?’ My musical director and lead guitarist asked if I cut down the set at all yet and I went, ‘Nope.’ So I said, ‘Just hand out the 31 songs to the band and tell them they don’t have to learn them all perfectly. They just have to be aware that we need to play these songs because sometimes the songs that you think are going to be the best aren’t and sometimes the songs that you think will never work end up being some of your favorite things,’” she told me. It was quite clear that Stevie Nicks created an adventurous and exciting air around her latest undertaking. Nicks acknowledged that she will have to revisit her classic hits before touching the new material. “Of course there are the songs that you have to do which are ‘Landslide’ and ‘Edge Of Seventeen.’ That’s fine. I love all those songs so I don’t care. I wish I could do all new songs but you can’t,” she chuckled. She continued, “I’m going to try to do some title songs. I’m going to make an effort to do an extremely difficult complex song called ‘Wild Heart’ which may totally go down in flames. The fact is I’m going to try because I always wanted to do it on stage. It’s a very complex and complicated song but I’m hoping it’s going to work. I’m going to do the songs ‘Bella Donna’, and ‘Rooms On Fire.’ I’m trying to represent every record. There’s a bunch of songs on 24 Karat Gold that haven’t been played by my band. We have to work through all the songs on 24 Karat Gold to see if they will work. If you miss one syllable you can be lost in the dark. There’s not even time to breathe. My musical director said ‘Oh my God. Call me when it’s over.’ I said, ‘Don’t worry it’s going to be okay. It’s all going to work out.’ He’s a nervous wreck. It’s going to be great because we are actually going to ‘represent’. That’s what people say today, right? This tour is a little bit about the glorious past up until now. These songs are not songs that were ever kicked off records,” Nicks told me. She then explained why the songs were never released. She said, “These are songs that were pulled off records by me because I didn’t like how they were recorded. Which means I didn’t like the production, I didn’t like the singing, I didn’t like the fact that it was made too much into a rock n roll song or not. These weren’t songs that I didn’t want to go out, these were just songs that weren’t right. I said ‘No, I’m not going to have a bad experience with this song’ so I pulled them. That’s where24 Karat Gold came from.” What is old is new again. Fans have been salivating to see these buried treasures played live by the icon. When explaining the process of recording 24 Karat Gold, Nicks told me, “We started with sixteen songs when we went to Nashville. And it came down to fourteen or fifteen, maybe. I said to Dave Stewart who has all my demos, ‘How can we make a record of these songs and do it while I’m off from Fleetwood Mac, while Christine is moving back to LA, while we are getting her straightened out? How long would that take?’ Dave said, ‘2-5 and 6-10 and then you go home.’ He followed up by saying, ‘You need to be on time and everything will be charted. And you want these songs charted exactly the way they were on your demos. They will be exact. They won’t be arguing with you. These are the best of the best studio musicians and they play on all different kinds of records every single day.’ We had to be organized and we were. It was so great because I didn’t have to learn to sing any of these songs differently because they were exactly as I wrote them. And they loved them. We recorded live. I was in a booth looking at all of them. The drummer, another guitar player, we had three guitar players and it was all there and I could see everybody. It was like playing in a club. When we were done, we jumped on a plane and flew back to my house. It was really fun. We had another three weeks at my house and then it was done. And it was amazing because the only records made in that kind of time were Fleetwood Mac because we really didn’t have that much money. We had a record deal. It was well known but it wasn’t the time to be self-indulgent. And Bella Donna took three months with a month of rehearsal and a month before that of picking out the songs. Every other record we’ve ever done has taken at least a year. Rumours, all of the records. We have enough money where everyone goes ‘We can do whatever we want.’ And I think sometimes that really doesn’t work that well for you because you really don’t need to book every studio in the city to put five thousand overdubs on music that is already really good. You are trying really hard to use your time wisely. You get better stuff and it is a lot more fun getting the stuff that you do get.” Nicks has had a lot of fun throughout her career and doesn’t plan on stopping anytime soon. Just when you think you have seen it all, Nicks makes sure that you haven’t seen anything yet. “I’m not going out to promote this record to sell records because I know people don’t buy that many records now. I have a really good record, and I can go up on stage and do as many of the songs that I can get away with doing,” Nicks told me. She continued, “This will be a very theatrical show. We have a lot of great pictures. This is something I have not mentioned to anybody else. The guy who took the cover of Rumours, Fleetwood Mac and all of my covers, Herbert W. Worthington III, died last year and he left me everything. He left me every picture he ever took, all the way back to Jimi Hendrix, Buddy Guy and all the Fleetwood Mac stuff. All of the press photo sessions. I have an immense amount of amazing photographs taken by this great photographer who was a dear friend of mine that I can now use. When he was alive, he was like ‘You can have that one picture but it’s going to cost you $5,000.’ I would go ‘Herbie come on! Nobody is going to pay that much money! Are you crazy?’ It’s never been seen. So we have these photographs to use and to put up behind me. There’s a picture for every song. A picture tells a thousand stories so that’s really exciting too. I’m going to try to make the beautiful art book that he always wanted to make but never got the opportunity to do.” Stevie Nicks is all about making opportunities that were once not possible—including another Fleetwood Mac tour. “We will go out again. We will probably go out in another year and a half,” Nicks said while shaking her head. She followed up by saying, “We have to for Christine. Because she’s like ‘Oh my God. I just came back to the band after sixteen years and you are going to break up now?’ We can’t break up now. We gave Christine her 120 shows and she flew through them. She’s five years older than me and you would just never know it. She looks great. You’ll get to see that show. She will never let us off the hook for that.” Stevie Nicks made sure to not let the next generation off the hook when she spoke about what it takes to succeed in the world today. Nicks then proceeded to give career advice for young women in this day and age. “If this didn’t work out for me I would have probably been a disc jockey or maybe an editor. I would have done something that was really, really fun. If this didn’t pan out for me and I finally started thinking 10 years down the line ‘Well maybe this isn’t going to work,’ I would have done something else and continued to do music in my leisure time. There is something also to be said about that. I think I could have been a great disc jockey because I love music and I love talking and I love telling stories. I think I could have been great at doing something like that. I always had something like that in the back of my mind even when I was sixteen when I told my parents that I was going to be a singer-songwriter and that’s that. And my mom’s like ‘Well you are going to take short-handed typing. Because you are going to be able to be an independent woman. You are going to be able to stand in a room with really smart men and hold your own. You are never going to feel like you are behind while the whole room of men are going to look at you like some stupid girl.’ My mom was seriously independent and she always had a job. She wanted that for me from the very beginning. To have my independence. I think that’s important when talking to kids, especially women. Assert your independence. Christine and I knew that we would never be treated like second class citizens when standing in a room with Eric Clapton, Jimmy Page and Robert Plant. All of the famous men. If anybody ever treats us with anything but total respect we will just walk out and it is their loss. And that was implanted in my head by my mom long before I graduated from high school.” Mom always knows best. So does Stevie Nicks. Nicks hammered the point home by telling people to always put in their best effort and to never be afraid of being different. She said, “You could be a really good photographer but guess what? Your 5-year-old is a really good photographer. The bar has been set so high now with everything. I think I’m a good photographer. But then I see these little kids taking these pictures and they are phenomenal. So you have to go back and say ‘Well I’m going to be better than that. The bar is raised and I’m going to jump over that bar. I’m going to be a better photographer than all the 5-year-olds and all the 25-year-olds.’ The bar has been raised in everything because of this tech world we live in. I don’t have a computer. I don’t have an iPhone. I have a camera that takes really good pictures and I have a flip phone in case of a fire. That’s it. I don’t live in that world but I see everybody around me that lives in that world. Sometimes I feel like I am an alien. Everybody is sitting with a silver computer on their laps and crying because the Internet went down. That’s really how people are and I don’t live in that world. Maybe we should talk about kids being truly creative, who want to be a performer or a writer. They can’t live in that world. Get out of that world. Start writing by hand. Life is beautiful. Buy a notebook, take out a pen and write it out instead.” In true Stevie Nicks style, she had one last thing to say to everybody.